PowerPoint is one of the most popular document formats, is widely used for business, education purposes. Except for standard presentation of PowerPoint, have you ever imagine that PPT can also be exhibited in a dramatic way with wonderful Flash animation? Free PageTurningMaker PPT to Flash is the right utility program to help you convert any PowerPoint document to Flash PPT show. Free PageTurningMaker PPT to Flash even allows user to edit page content of PPT, record Audio for each page, define Flash effect and so on. 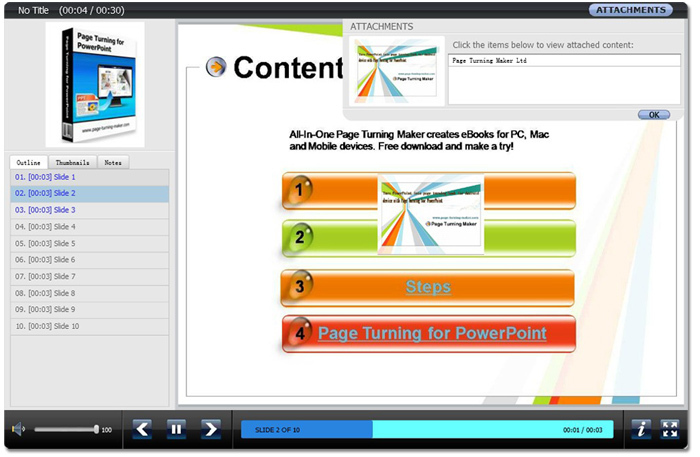 Completely Free - Free PageTurningMaker PPT to Flash is a great PPT to Flash converter, but it is distributed as freeware. It asks for no money to install and use this wonderful software. And user can reach complete set of features of Free PageTurningMaker PPT to Flash without limit. Flash Animation Effect - Free PageTurningMaker PPT to Flash convert PowerPoint document to Flash animation show, which present PPT with fabulous Flash effect, so that you are abled to view your PowerPoint like a video. Moreover, Free PageTurningMaker PPT to Flash allows user to custom image transition effect, define transition interval, and record audio for each page. Rich Edit Options - Free PageTurningMaker PPT to Flash also provides rich edit options for user to custom appearance and add content to pages such as add text, graph, blur. Meanwhile software allows user to edit Flash document information like description, attachment (with link) even add logo and creator information. Convenient Operations - Free PageTurningMaker PPT present a intuitive operation interface which help user to know well how to operate. Also Free PageTurningMaker PPT to Flash enables user to record audio for each page with built-in record function, and it offer various Flash transition effects that users can simply select from effect list. Flexible Output Types - Free PageTurningMaker PPT to Flash provides three output types for user to create their Flash PowerPoint slide show in either online type or offline type. For online type ( *.html), it can be upload to website or embedded into webpage to enrich website content. And for the another one, software save document in popular exe or zip, which can be used in different device. Advertisement Features - Free PageTurningMaker PPT to Flash is also a great advertisement solution for business because of its advertisement features. It can be applied to create business Flash PowerPoint show and link and company information like logo, description, email address can be added to produced Flash file so as to promote your business. 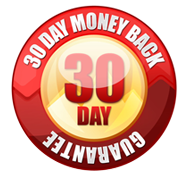 Want to convert PDF to wonderful page turning book under Windows OS, I recommend you Page Turning for PDF and Page Turning Pro for PDF. Or for Mac OS, refer to Page Turning Pro for PDF Mac and Page Turning for PDF Mac. Please feel free to download and have a try.